ET Tea is Responsive Joomla! template that targets for tea company website. 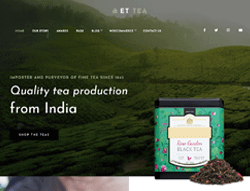 Tea Company Website Template is supported by Google Fonts, which means that your blog posts and recipes will be easy to read. You also get access to a wide collection of high-quality stock photos to make the posts more interesting. All these contents can be managed through the Admin Panel feature, which has a user-friendly interface. ET Tea builds with latest Bootstrap CSS Framework, Support Font Awesome and K2 extended style. Furthermore, it comes with 4 color schemes helping to create excellent websites with various layouts. With an overall responsive design, we guarantee that your website will appear the way it should on the best platforms. It means users can go for mobile versions of the website if they prefer it. Browse through our category today and choose the theme that suits your tea company the best.